Staff shortages in radiotherapy units across the UK are leading to long waits for cancer patients and may be reducing their survival chances, a report says. Departments are often less able to cope with the volume of patients than their counterparts in many poorer countries, a British Medical Journal report said. The resulting longer waits are leaving many patients with reduced chances of surviving cancer, the report said. The Department of Health agreed an urgent capacity expansion was needed. Report author clinical oncologist David Dodwell said despite substantial funding increases over the past five years, shortages of radiographers, physicists and other specialist staff caused long waiting lists. "Radiotherapy services in the UK are inferior to those in most developed countries and indeed many poorer countries," he said quoting earlier research. He told the BBC News website: "Unfortunately the here and now of this is in terms of radiotherapy capacity in the UK in many centres in the UK is a real problem." This meant there was a long delay between referral and treatment starting, leading to reduced survival chances for certain cancers, Dr Dodwell said. Cervical cancer patients' chances of survival were cut by longer waiting times for radiotherapy, he said. And the chances of tumours recurring in head and neck patients waiting more than six weeks for post-operative radiotherapy rose three-fold, he added. While breast cancer patients have a 60% greater risk of relapse if delay between surgery and radiotherapy exceeds eight weeks. Dr Dodwell said department managers found themselves "between a rock and hard place", having to juggle competing priorities and pressures while balancing the rights of patients. There needed to be a national debate on how to prioritise treatment and tackle waiting lists at a national level, he added. National Director for Cancer Professor Mike Richards said demand for radiotherapy had increased in recent years which was why trainee numbers had doubled. "The National Radiotherapy Advisory Group will shortly be making recommendations to ministers on future capacity requirements. "We agree that expansion of radiotherapy capacity is urgently needed - we have already done a lot but need to do more." A survey in 2003 by the Royal College of Radiologists, which represents radiologists, found around 70% of patients waited longer than a month to start treatment. The college said despite a slight improvement in equipment and staffing levels since then, over half of patients still waited more than a month. The college's registrar Dr Michael Williams said: "Continued and sustained investment in all the elements that go up to make the NHS radiotherapy services is required if the UK is to have a modern service able to deliver the best treatment to patients in a timely way." Richard Evans, of the Society of Radiographers, said of his members were frustrated that they could not provide the quality of care they would wish. "Significant improvements have been made in recent years, however we agree with the authors that the fundamental need to see a significant increase in radiotherapy capacity remains." Clara Mackay, director of policy at support charity Breast Cancer Care, said the study confirmed mounting evidence of a national crisis in radiotherapy. More staff were clearly needed, she said, but this will take time so in the meantime everything possible to keep waits down had to be done. She added: "The priority must be to ensure that all cancer patients get the treatment they need, when they need it. Government must make it a priority for this to happen." 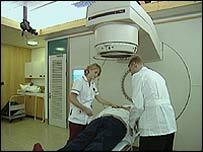 Dr Lesley Walker, director of cancer information at Cancer Research UK, said it was investing to improve radiotherapy treatments. "But without more action to ensure Britain has the required numbers of radiologists and radiographers... patients will not receive the best available care, which is what we should all be working to provide." John Baron, Shadow Health Minister, said: "It is unacceptable that ministers still have no plans to monitor and reduce radiotherapy waiting times, which we know are lengthening. "The government's cancer targets are focused on the front-end of the patient pathway, and so later stages of care - including radiotherapy - are struggling to keep up."